1 Member of Parliament for Deux-Sèvres, Member of the Board of Directors of IFEN, France. 2 Directeur Régional de l'Environnement de la Région Centre, France. 3 Bureau Fédéral du Plan, Bruxelles, Belgique. 4 Université de Tours, Centre de Recherche Ville-Société-Territoire, France. 5 Institut für Regionalentwicklung und Strukturplanung, Erkner, Germany. 6It has become commonplace to hear many elected representatives talk about sustainable development, particularly during an election period. We are indeed entering such a period in France, and I have no doubt that we will be hearing the concept bandied about. However, as I see it, the implementation of sustainable development is still misunderstood and as a consequence remains too fragmentary in our regions. There are many reasons for this, but I think that over and above the actual definition of sustainable development, in general it is not in the culture of elected representatives and technicians to integrate the solutions to different problems as part of a whole, and moreover they do not have the means to do so. It is specifically about these means that I would like to speak in detail. 7I will not go into the definition of sustainable development, which is now well-understood and aims at simultaneously improving environmental, social and economic conditions in development projects. 8In order to take account of environmental objectives in planning strategies, it is essential to have reliable indicators of development and equally reliable assessment criteria. 11None of these has been initiated, let alone taken into consideration, except in economic development policies. At the most, certain environmental indicators are used occasionally to enhance the action of elected representatives. 12However, local authorities constitute the first institutional step in the process of sustainable development. They have a decisive role and the commitment of the directors is fundamental in expressing social requests, in environmental management and in ensuring the integrated organisation necessary for economic development. This is the meaning of Chapter 28 of the Action 21 programme of the Rio Summit of 1992. 13Since then, France has passed a law on sustainable regional development, which gives sustainable development a statutory and legislative basis. 14Programming State-Region Plan contracts is thus a particularly important act which allows areas close to the Region or the State to specify procedures as well as the resources required. Thus, urban agglomeration plans will determine political orientations according to a local definition of international commitments finalised during the Rio Summit. In the same way, the Country Charters will constitute the common plan for sustainable development of these areas according to the same international agreements. 15It is equally important that each local authority must have at their disposal proven and useable indicators and criteria, whatever the region concerned. These tools are necessary for analysing and comparing actions undertaken, for prioritising them, ensuring they are carried through and assessed, for adapting actions and setting up a coherent and long-term strategy, and finally for ensuring that all the citizens and people involved locally are kept regularly and consistently informed. 16RESPECT is a tool which provides a frame of reference for communicating about and supporting the environmental policies of regional authorities and was created by local urban authorities, assisted by the Poitou-Charente region, Europe, the State and the CNFPT (Centre National de Formation du Personnel Territorial Training Centre for Local Government Staff). It's specific aims are to draw up these indicators using a shared method and to keep all the actors informed about development throughout Europe. 17It is therefore essential to have a clearer view and to make a real synthesis of all the steps undertaken. RESPECT II has been set up to study and to create essential links between organisations and people responsible for assessing urban policies in Europe, notably the urban audit of European regional policy management, common European indicators of the group of European experts in the urban environment, and/or the local authority plan for the environment set up with the collaboration of Ademe (Agence de l'environnement et de la maîtrise de l'énergie Environmental and Energy Agency). RESPECT also aims to work towards drawing up a common European system for assessing European policies for the environment and sustainable development. 18To speak about sustainable development implies that one has a small idea of the future and of sustainability. As everyone agrees on this concept and talks about it, allow me to express some doubt that everyone attaches the same meaning to the same words. 19Who can pride themselves on knowing the future? It is possible to believe certain things, like, for example, "the future cannot be conceived by generalizing how the developed world has developed to all the countries of the planet. Such a policy would drive us into the wall." Excellent! Let us construct and set up a new development model. As far as I am concerned, I am sure that the society of tomorrow will have to be more qualitative (saving energy, resources, space, preserving ecosystems and biodiversity), if it wants a hope of surviving. 20But the complexity of the social, economic and environmental systems of our society should incline us to be modest. In fact, economists are incapable of predicting exactly the rate of growth a month ahead, of anticipating a recession or a stock market crash… For their part, sociologists more often explain than predict the facts of human society. As far as research into the environment is concerned, at what stage is it in France? 21We can also hold certain beliefs such as: "the further one goes from the local level, the more one can have a global and collective view of common interest". The regions are probably best placed to undertake research into sustainable development. 22Regional Development, with powers at the regional level, is well situated to look at sustainable development and thus to developing research in the field. Taking account of environmental issues into all policies, including that of regional development, is necessary, but is not enough for sustainable development. It is also essential to be able to challenge one's own ideas and be open to dialogue with others. 23Consequently, Europe, with the assistance of its States if they so wish, must support the regions which are prepared to develop research into sustainable development. But, let us not deceive ourselves – there is still much to do in the economy, society and the environment before we can speak of sustainable development bringing the three together. For example, we should perhaps look again at our economic indicators for development. I am thinking in particular of energy. Our economists tell us that the more energy we consume, the more we develop economically. 1 am surprised that nobody has yet dared to propose an absurd development model on traffic jams, suggesting that they are making a country richer. And yet, according to this principle they enrich the country which benefits from them because they are using energy! Other social and environmental costs should therefore be included to bring us towards sustainable development. Research into sustainable development should give this priority. I am firmly convinced that the regional level is the appropriate one for developing this research. 24Moreover, every means should be used to develop an assessment of the environment at the regional level. developing research to fix reliable indicators for monitoring sustainable development. 27What is needed to bring coherence in such a multi-level and multi-tools decision-making processes is a methodological framework based on common values reference, such as a set of principles and criteria. A methodological approach of sustainable development has therefore been developed during the three last years by the Federal Planning Bureau of Belgium. Contrary to most approaches, this methodology does not reduce the foundations of Sustainable Development to "a" single, unique principle of sustainable development. It proposes a framework based on 5 major principles of the Rio Declaration. 28These 5 principles or dimensions of Sustainable Development provide, de facto, an operational definition of Sustainable Development of the wider type. None of the 27 principles of the Rio Declaration can be left aside, all of them must be taken into account to evaluate the contribution of a public or private project or policy to sustainable development. But those five principles are emphasized as the five criteria or dimensions of Sustainable Development6 as they are the most innovative, the most characteristic and the most all-embracing ones. They are reported in box 1. 7 Principles 7, 3, 4 15 and 10 of the Rio Declaration (1992). - Participation in decision-making processes: environmental issues are best handled with the participation of all concerned citizens, at the relevant level. At the national level, each individual shall have appropriate access to information concerning the environment that is held by public authorities, including information held on hasardous materials and activities in their communities, and the opportunity to participate in decision-making processes. State shall facilitate and encourage public awareness and participation by making information widely available. Effective access to judicial and administrative proceedings, including adress and remedy, shall be provided (n° 10). Globalisation: did they acknowledge the global dimensions of a Sustainable Develpment problem as well as the differentiated responsibilities of developed countries and seek to achieve solutions taking into account international interdependences? Intergenerational equity: did they acknowledge that the present generation is being "fair" or "unfair" to future generations by constructing or depleting major sources of future wellbeing and seek to achieve a better balance for the benefit of long term concerns? Integration: did they acknowledge the need of and integrated approach taking into account as many interlinkages as possible among social, environmental and economic problems and seek to curb unsustainable trends of our development? Uncertainty and precaution: did they acknowledge the existence of uncertainty and irreversibility in systems of which we do not understand the full workings of and refuse to use the lack of (full) scientific certainty as a reason to postpone Sustainable Develpment policies? Participation: did they acknowledge the need to implicate the whole society and associate the major groups in an integrated decision-making process and do they promote the necessary institutional changes for the implementation of this participation process? 30This report had revealed that most part of the actions at federal level in Belgium during the period 1992-1998 related to the major themes of Sustainable Develpment meet the requirements of sustainable development in an uneven fashion, and are insufficient, despite the progress that has been made at the institutional and conceptual levels. Insufficient efforts to clarify development options on a participatory basis. 32The Act of May 5, 1997, stated that Federal Plan for Sustainable Development should be elaborated and adopted after the publication of the Report. Works on the Plan, supported by the methodological framework provided by the Report and by the drafting ability of sustainable development experts of the Federal Plannning Bureau (FPB), was placed under the authority of the Interdepartmental Commission for Sustainable Development (ICSD – senior officials of all departments). The Plan begins with an overview of the ultimate objectives of sustainable development and basic principles used as criteria for the assessment of policies and measures towards sustainable development (global awareness, long term concern, integration, uncertainty and precaution and, finally, participation of major groups and responsibility of citizens). The themes of the plan are then developed with a very short status questionis for each theme followed by a set of coherent thematic action plans including objectives, policies9 and measures. The plan also indicates who is responsible for the realization of these action plans. About twenty themes of sustainable development are integrated in the Plan including "focus" themes such as changing consumption patterns, combating poverty and social exclusion, reducing over-indebtness, environmental health, sustainable development of agriculture, protection and managing the marine environment, conservation of the biodiversity, sustainable development of energy, promoting mobility compatible with Sustainable Develpment and protecting the atmosphere. The twenty themes of the plan are related to more than 50 % of the chapters of Agenda 21. 33The preliminary Draft Plan was released by the ICSD on the 10th of January 2000. It underwent an extensive and probably unique consultation process for such a detailed document. From February 1 to March 31 2000, 17.000 copies of the preliminary draft plan were distributed. The preliminary draft of the federal plan was automatically sent to all the members of the federal Parliament, the governments of the Regions and the Communities as well as to the members of the Federal Council for Sustainable Development. The preliminary draft plan could also be examined in all municipal offices and public libraries. A preparatory mailing addressed to all municipalities and public libraries was carried out at the same time as the advertisement of the public consultation. More than 100 public debates, workshops, briefings and presentations of the preliminary draft plan were organized throughout Belgium during February and March. Moreover, public interest associations or organizations could also introduce proposals to obtain subsidies for information projects within the framework of the consultation of the population on the preliminary draft plan. Twenty-five of the 46 proposals submitted were approved and supported financially by the cabinet of the Secretary of State for Sustainable Development. A little more than 2.100 responses, amounting to some 17 000 remarks on the text of the plan were sent by citizens, organizations, institutions and other important associations to the secretariat of the ICSD. 34One can conclude from a first analysis of this reactions expressed as a percentage of the population consulted this rate, corresponds to that of other consultations. But one of the main conclusion of this first consultation on a Sustainable Develpment plan is that, for future consultations, the target groups must be better defined and that it is necessary to work in a more intensive and more specific way with certain target groups. In general one can conclude that the Belgian federal authorities have all elements gained from this experience to ameliorate the widest possible 'public participation' during the planning process. 35One of the gaps that this consultation process seeked to bridge is the gap between the way politicians perceive sustainable development and the way civil society does. And, based on our experience, one of the major groups of civil society which should be much more involved in this kind of process is the scientific and technical Community. Our view is indeed that at present, research scientists in most countries largely choose to observe political debates from the sidelines, which implies a loss of knowledge for the entire society while in most countries, including ours, they could help bridging that gap and thereby contribute to sustainable development much more than they do at this stage. Though citizens often have a good understanding of problems connected with the environment, human welfare and economic development, this understanding could be improved by processes confronting it to the results of research in natural as well as in social science. These interactions could help the political decision-making to bridge the communication gap between policy-making and society about sustainable development challenges. If scientists were to turn to civil society and share more systematically their findings, citizens would be better equipped to discuss and question political decisions on a more equal footing with politicians. Conversely, as citizens usually have less understanding of the choice process between different goals and between the measures than need to be taken, they would also benefit from understanding better the wider perspective that politicians can bring in the decision-making process. 36An example of processes through which one research policies that give research scientists a more active role in realising sustainable development can be found in the IPCC [the UN's international committee of climate scientists] which is a brilliant example of co-operation between scientists and politicians. There are intensive debates between the IPCC's participating scientists, in order that common standpoints are arrived at by accepted scientific procedure. In no way do they relinquish their scientific method, but, by taking a transdisciplinary perspective, they often manage to deliver extremely robust foundations to politicians for their decisions to be based on. In this way scientists can really contribute to a broad learning process as well as to the improvement of the decision-making while, today, much of the foundation for decision-making is very much seen as only provided by politicians and their staffs. At present, it is not really considered a merit for scientists to contribute to public debate or to the preparation of a political decision, even when they are really needed in order to improve their relevance to the real social, economic and environmental challenges. This type of engagement of the scientific community is very much called for by Agenda 21 (since 1992) and subsequent decisions of the Commission on Sustainable Development of the United Nations. It is thus high time that we develop science policies that can support and encourage it. 37At the end of this symposium, I was asked to put forward my ideas as a researcher about the needs for research in the domain of regional sustainable development. The points I would like to put forward here are the outcome of the debates and presentations of the two previous symposiums, and also of the discussions of the last two days. 39Sustainable development clearly requires achieving consistency between the policies carried out by numerous actors at different territorial levels. In terms of research, the question clearly involves increasing the knowledge of the methods of this governance: several speakers suggested ways forward from both a conceptual and a practical point of view. It seems to me that the relevant question in this respect concerns the ways different levels of intervention can work together. It therefore seems important to achieve a better understanding of how the networks of actors work and interact. 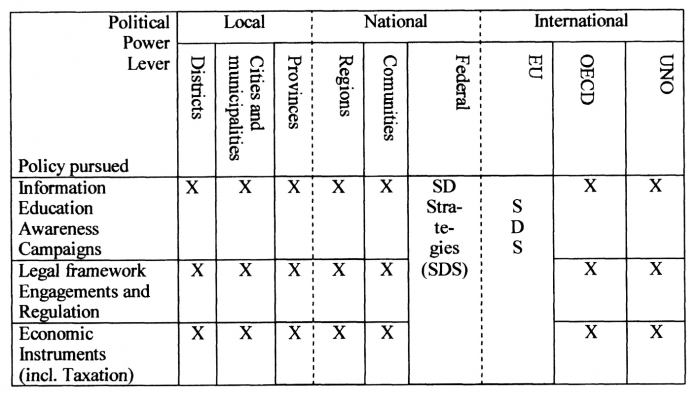 40The results of my own research in this area highlight the importance of the role of the intermediary actor who can mobilize decision-makers at different territorial levels within one public action sector10. This intermediary actor can ensure an interface between national and international territorial levels and local levels. In this respect, it would be interesting to investigate the possibility of regions taking this role of mediator. The analyses presented throughout this symposium highlight the importance of developing a common questioning, and indeed a common language. How this can be developed remains as yet little understood. 41Still with respect to governance, another line of further study is the question of assessment before and after public action: assessment is one of the means of ensuring the transparency of the work of action networks, and of everyone involved in these networks. However, over and above the available methods and techniques for assessing public policies, it is important to analyse what these assessment periods contribute to the quality of decision-making. 42More broadly, if, as was brought out in a number of presentations at this symposium, the opening-up of decision-making processes to the multiplicity of interests involved is desirable (cf government official reports), it would again require analysis and experimentation to evaluate the real contribution of this openness to the quality of decisions implemented, and also tackle the question of the legality of different stake-holders participating in public decision-making. In this respect, methods of constructing a "territorial legitimacy" appear to lie at the heart of this question and deserve particular attention. This would again provide justification for working at an infra-national spatial level. 2. 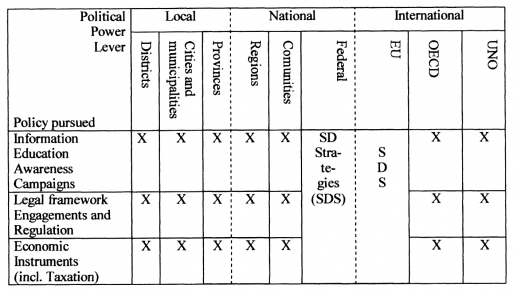 Regions – Cornerstones for Sustainable Development? 43The spatial aspect of sustainable development is both fundamental in its implementation but still little studied in the work of researchers: if sustainable development has been and continues to be the frequent subject of analysis by various disciplines (from natural sciences to economic and social sciences) the theme of its territorial roots remains little explored. However, the territorial context of sustainable development seems particularly interesting to investigate, because it is on the spatial scale that possible contradictions in sustainable development appear. It is also through a spatial analysis that the role of resources which are specific to the territory become clear, as well as the effects of mobilising politico-administrative actors. 45However, these first conclusions need to be backed up and developed. 46The experience of the regions which have been granted structural funds (objectives 1 and 2) highlights the diversity of possible ways-in to encourage sustainable development. One particularly profitable way-in is to make the obstacles to sustainable development visible. In this respect, research can contribute to this approach by providing a theoretical and practical analysis of the cultural, historical, economic or social conditions which hinder the emergence of sustainable development. Defining the regional indicators of sustainable development is important in this respect. However, while it is important to determine the directions not to be taken as well as those which should be encouraged, it is equally important to know how to take this direction, because it has become clear that there are different ways of operating according to the place, the time, the resources and the institutional capacities involved. 47Likewise, in terms of the tools of sustainable development, if mobilising the financial tools appears important, it is above all the ability to combine the various public political tools which lies at the heart of this question. Among the means of ensuring coherence between the policies carried out by different actors at different territorial levels, we can note contractual, procedural or institutional routes. In this respect, it is interesting to see the constitution of a shared resource centre for State and regional departments in the Nord-Pas-de-Calais Region. It would be interesting to monitor its development and how it works, comparing it with other experiences in other countries. 48More generally, a rise in generalities seems necessary today, because while there is a strong demand for sustainable development, as shown by the contributions at the different conferences, the methods of responding to expectations are still lacking. However, this increase in power should take place by incorporating from the start systems for monitoring and evaluation in order to learn from experiences and thereby capitalise on knowledge and know-how. 49The need to describe the state of the environment and the pressures exerted by human activities and to monitor the progress of environmental policies has revealed the inappropriateness and cost of the traditional systems of collection of date and statistics designed to respond to sectorial policy needs. This has become even more obvious with the need to assess progress towards sustainability, at different territorial levels and distinguishing the contribution of the various policy sectors. developing qualitative data capable of assessing a region's scope for action and the desire/viewpoints of actor groups. 51The assessment of the experiences made by the regions in trying to strive for a more sustainable development shows that lack of knowledge and of adapted tools constitutes one of the limiting factors. 52The research community thus has been invited to submit proposals in this area under the Environment and Sustainable Development Programme of the 5th European Framework Programme for Research, Technological Development and Demonstration Activities. Furthermore, the European Institutions have given a clear policy indication that the regional dimension should be given increased weight in the development of the European Research Area and in the preparation of the 6th Framework Programme. cross-regional comparisons taking account of diversity. 54Furthermore, in many cases the need is to adapt available results to the specificities of sustainable development issues (e.g. stakeholders involvement, public participation). 55However, over and above this specific work, it seems to me that the role of research is to contribute to making the risk of non-sustainable development visible (without claiming to be exhaustive) and in making clearer what is at stake in moving towards sustainable development. 56In view of the integration and multidisciplinarity requirements of Sustainable Development, it is necessary to re-examine the opportunities offered by existing and planned European instruments (e.g. the coordination of the national and Community research programmes; networks of excellence; large projects of research and demonstration). 57Some practical suggestions on improving research on sustainable development are based on what we are not doing particularly well at the moment, on what we are not doing at all. What really came out of the discussions is that there is not necessarily a knowledge problem, there is a problem in the dissemination and exchange in this knowledge. There are two prospective on the dissemination; one between the science community and the policy making an executive community on the other hand. 58We need to go beyond the best practices. We need to go beyond just banding around good examples, without any ideas of the context institutional within which the best practices can function. 59We need a more systematic approach to compare experiences in different regions and in different European context. One of the suggestions would be, not only, pilot projects, but more systematically, perhaps for a large number of pilot projects, looking one particular issue, a real problem issue, may be indicators systems, developing sustainability objectives, it may be into municipal corporation and a number of things like that. It conducts a number of pilot projects across the EU and in the same time it comes researchers into it. The researchers have to be in there from the beginning observing what's happen in this process, because as it has been said, we are talking about a process, not only the results who came out. We have to support the idea that researchers have to be more interactive with end users. There is also an important signose in the EU founded research. 60Within the scientific community itself I think we need, as a research community about sustainable regional development, to look beyond boundaries. A lot of the issues we were talking about are actually research in other fields; other fields of research such as policy implementation, urban development, institutional change. 61We can benefit a lot from drawing on results from those communities, otherwise reinventing real life. 62Another issue within the scientific community is interdisciplinary research. 63We need to look across programs in the future if we are looking at the 5th and 6th framework. We need to be looking at results emerging from different programs within the 5th framework. 64The 6th framework is much more about bigger and better project getting a lot of more research partners together. The bigger the projects are with a large number of researchers, most dangerous is that end user being involved in those project may diminished because of the transaction cost involved. Trying to coordinate such a huge project will necessary be to the detriment of the others projects. 6 This approach has been first developed and used to assess belgian federal policies from 1992 to 1998 in the Belgian Federal Report on Sustainable Development published by the Federal Planning Bureau in august 1999. It is futher developed in § 19 to 31 of the Belgian Federal Plan of Sustainable Development laied down by the Belgian Federal Government by Royal Decree in September 2000. 8 The first Belgian Federal Plan for Sustainable Development 2000-2004, adopted by the Federal Government of Belgium on 20 July 2000 and laid down by Royal Decree of 19 September 2000, § 19, page 9. 9 As in the Federal Report on Sustainable development, the policies are classified into two groups. The first contains the federal policies «focused» on major sustainable development themes such as the ones quoted above. The second group includes other federal policies, which can support the goals of the former (such as fiscal, finance, science and foreign policies). 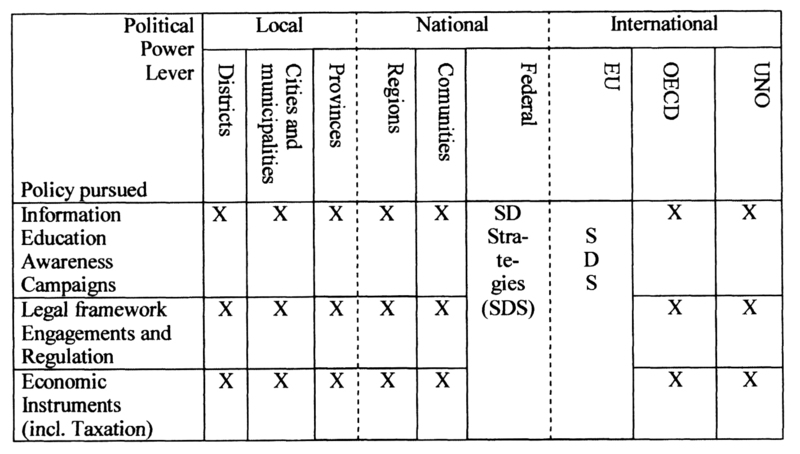 10 Larrue, Knoepfel, 1998, The contribution of subsidiarity principle to sustainable development, Communication at the "Regions-Cornerstones for Sustainable Development" conference, organised by the DGXII of the European Union, Graz 28-29 October 1998. PERRIN-GAILLARD, Geneviève ; et al. Round table In : Recherche et développement régional durable : Actes du Troisième symposium européen. Proceedings of the Third European Symposium [en ligne]. Tours : Presses universitaires François-Rabelais, 2002 (généré le 20 avril 2019). Disponible sur Internet : <http://books.openedition.org/pufr/1356>. ISBN : 9782869063495. DOI : 10.4000/books.pufr.1356. Perrin-Gaillard, Geneviève, et al.. “Round table”. Larrue, Corinne. Recherche et développement régional durable : Actes du Troisième symposium européen. 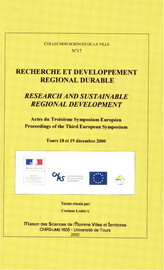 Proceedings of the Third European Symposium. Tours : Presses universitaires François-Rabelais, 2002. (pp. 267-283) Web. <http://books.openedition.org/pufr/1356>.